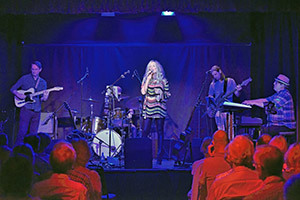 The Joni Mitchell Songbook brings together a group of top-drawer musicians, led by singer Sarah Miller and keyboard player Aidan Goldstraw, whose devotion to the artist’s back catalogue shines through in performance. This is no ordinary tribute act – it’s an evening spent together, exploring the work of a musical genius. This comprehensive survey of Joni’s career includes landmarks such as Big Yellow Taxi (her most covered song), River and A Case of You (both from the breakthrough album Blue), the radio hits of Help Me and Free Man In Paris (from double-platinum Court and Spark) and the jazz-infused stylings of In France They Kiss On Main St (The Hissing of Summer Lawns) and Coyote (Hejira). More information here.